If you’re interested in signing up for Fantasy Labs, use this link to get your 1st month of Pro for only $15. 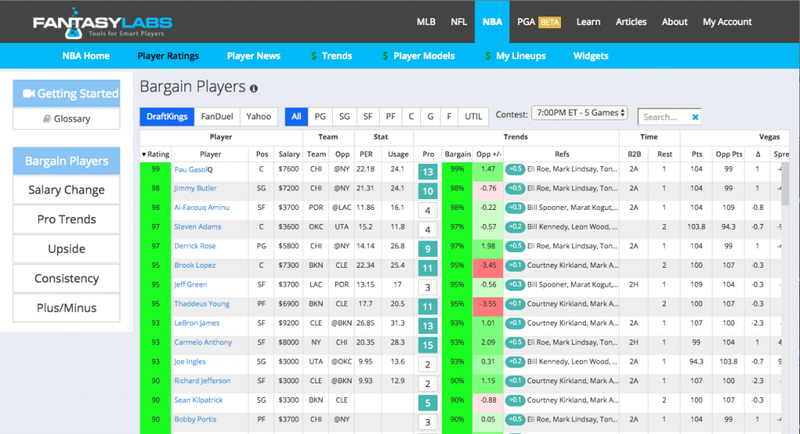 In Daily Fantasy, everyone is looking for advanced statistics, models, and tools that can give them an edge on the field. Many websites offer these products, and there are some great ones out there, but no website offers tools and models as advanced and interactive as Fantasy Labs. If you want to be able to manipulate and create your own projections, back test strategies, and analyze a wide array of advanced statistics, Fantasy Labs is the place for you. Fantasy Labs is not just a projection system or a DFS Tool, it has several different unique offerings, some free and some paid, that help you gain an edge in DFS. They currently offer products for NBA, MLB, NFL, and PGA. The Player Ratings page on FantasyLabs is free to use, and is a great introduction of Fantasy Labs approach to Daily Fantasy Tools. The above is a screenshot of the Player Ratings page for a night of NBA. Combining numerous advanced statistics, Fantasy Labs tool assigns a rating to each player depending on which tab you choose. You can rate players based on the difference in salary between DraftKings and FanDuel (Bargain Rating), as well as their salary movement, their signature “Pro Trends”, Upside, Consistency, and Plus/Minus (essentially, how much better or worse a player is expected to perform given the relevant statistics). Essentially, the player ratings page is a way to analyze several different statistics without having to do a thing. By simply looking at the top rated players on the Player Ratings page everyday, you will find under the radar plays that others will likely overlook. The Player Models Tool is offered for all sports, and is a combination of Fantasy Labs signature Player Ratings with a Projection system. I find this tool absolutely fascinating. 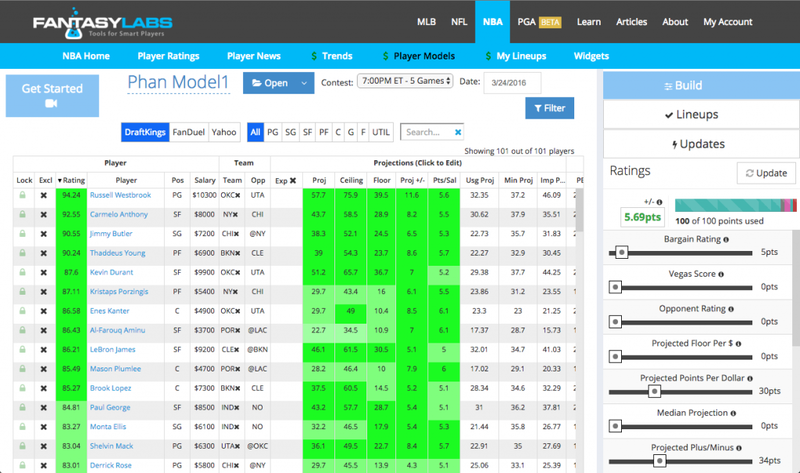 While other DFS tools simply display data, the Player Models tool actually allows you to manipulate and interact with the data. I’ll describe further below. Like the Player Ratings Page, the Player Models tool rates players on a combination of advanced statistics. But there are two key differences. First, FantasyLabs includes their own projections in the statistics, which helps narrow down the highest rated plays to only the most useful players. Second, the Player Models tool allows you to create your own weights, meaning that you control which statistics are favored, and which statistics are ignored. Fantasy Labs offers pre-made models from some of their top pros. You’re welcome to simply use their models, but you also have the ability to adjust them to your liking, or even start from scratch. You can perfect your model and save it on the Fantasy Labs interface, allowing you to look at your model every day without having to adjust it. One great feature that you’ll see throughout Fantasy Labs is what they call historical “+/-“. Basically, Fantasy Labs automatically back-tests your particular model, so if your weights are headed in the right (or wrong) direction, you will see some confirmation from the historical +/-. That being said, be wary of sample sizes here, there’s not enough data during an NBA season for +/- to be completely accurate. 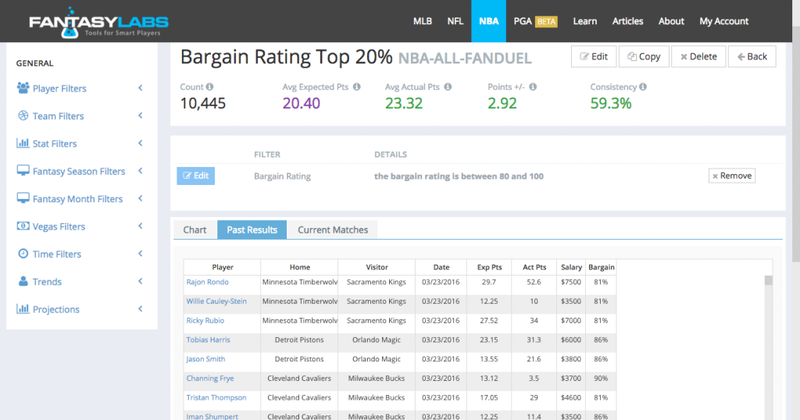 The Trends tool on Fantasy Labs is the only tool we’ve found online that allows you to back-test your own DFS ideas. Using Fantasy Labs giant database, you can set parameters and see whether certain statistics are actually predictive of performance. On the left side of the page is where you can select your parameters. In the above example, we’ve selected the statistic Bargain Rating and set the parameters to only players in the top 20% of Bargain Rating each night. Then, the Trends tool evaluates how helpful this statistic is, and it’s actually quite helpful. The average expected points for players who fell under these parameters was 20.4, but they scored on average 23.32 points, good for a +2.92 +/-. You can use the Trends tool like this in anyway you like, even selecting a player to see how he’s done in the past in certain types of match-ups. For example, I took the bottom 10 teams in offensive rebounds allowed and analyzed how great offensive rebounding players (i.e. Andre Drummond, Enes Kanter, and Tristan Thompson) performed when they matched up against those teams. I found that those players had a +/- of 3.23 when playing those teams. The above example is quite simple, but don’t be fooled, the Trends tool allows you to use 100’s of advanced statistics like Pace, Ceiling, and Moneyline. You can basically evaluate any situation or statistic you like, combine as many parameters as possible. I will emphasize again, however, that be wary of small sample sizes. The more detailed your analysis, the smaller the sample, and sometimes your results will not be reliable. Fantasy Labs also offers a lineup optimizer, which I will admit I’ve only toyed around with, but seems in line with other lineup optimizers like DFSNerd. Fantasy Labs also has a great news page, which is particularly relevant for DFS NBA, that lets you know who may be suddenly out of the lineup. Fantasy Labs is one of my favorite Daily Fantasy tools because of it’s unique offerings. With so much parody out there in DFS, finding a tool that gives you a new angle can be invaluable. We recommend Fantasy Labs for any player looking to step up their Daily Fantasy game.